Planning for a City of Culture gives us a new way to understand how cities use arts and culture in planning, fostering livable communities and creating economic development strategies to build their brand, attract residents and tourists, and distinguish themselves from other urban centers worldwide. While the common thinking on creative cities may coalesce around the idea of one goal––economic development and branding––this book turns this idea on its head. 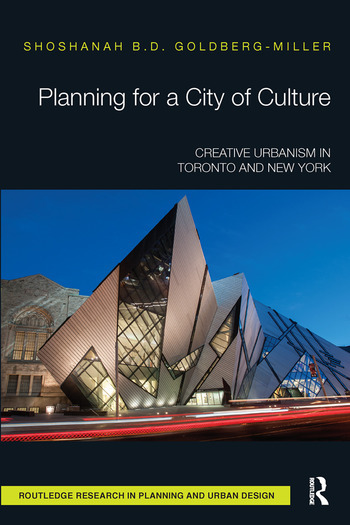 Goldberg-Miller brings a new, fresh perspective to the study of creative cities by using policy theory as an underlying construct to understand what happened in Toronto and New York in the 2000s. She demystifies the processes and outcomes of stakeholder involvement, exogenous and endogenous shocks, and research and strategic planning, as well as warning us about the many pitfalls of neglecting critical community voices in the burgeoning practice of creative placemaking. This book is an essential resource in examining the development and sustainability of the global trend of integrating arts and culture in city planning and urban design that has become an international phenomenon. Perfect for students, scholars, and city-lovers alike, Planning for a City of Culture illuminates the ways that this creative city trend went global, with the two case study cities serving as perfect illustrations of the power and promise of arts and culture in current and future municipal strategies. Shoshanah B. D. Goldberg-Miller specializes in creative economic development, cultural policy, arts entrepreneurship, and nonprofit management. She has published in Artivate: A Journal of Entrepreneurship and the Arts, and Journal of Enterprising Culture, and co-authored a chapter in Creating Cultural Capital. She is Assistant Professor in the Department of Arts Administration, Education, and Policy at The Ohio State University, and Affiliate Assistant Professor of City and Regional Planning in the Knowlton School of Architecture.